Today's Letters: Dear Class President, tonight we get to celebrate the last 3 years of school at your PA banquet. Promise to only take 439 pictures during your speech. 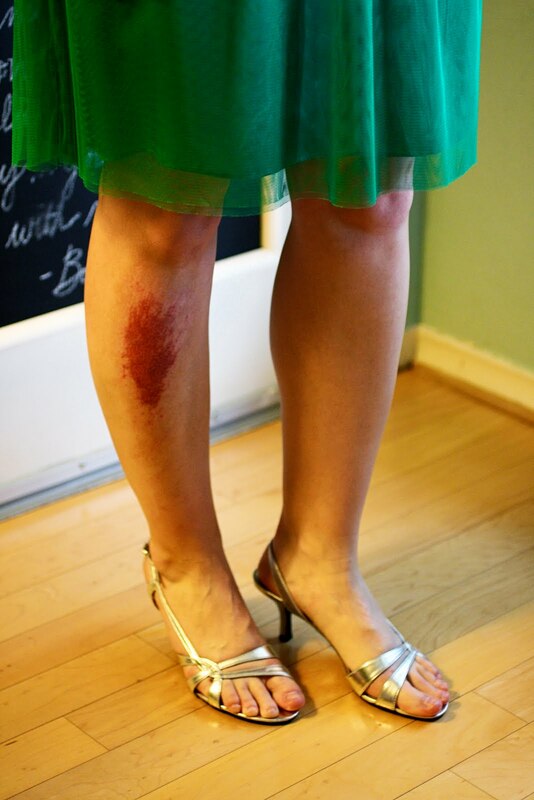 Dear Kickball Injury, thanks for making me look like Christmas as I rock my 4" scab and green dress. Santa says, "Ho, Ho, Ho, Holy Punky Brewster." Dear Tyroch, yesterday we went shopping for new shoes. You taught me words like kitten heals, lippy (lip gloss), and clutch. I'm convinced I'd still be rocking my TOMS, Burt's Bees, and Meatbagz if it weren't for you. Dear Husband, t-minus 2 days until friends and family arrive from all over the country to celebrate you this weekend. You are the most loved guy I know. What's your favorite lip gloss or ChapStick? Enlighten me! I am skipping the dress tonight and wearing slacks, heels and a dressy top. My Burts Bees is my favorite chap stick! See you tonight, First Lady! For everyday, EcoLips are my favorite - in the mint flavor. If I'm feeling like a little color, I'll always go with Fresh's Sugar in the rose color. Burt's Bees was my first love, and still has a permanent place in my purse (or pocket). Lately I've also been digging C.O. Bigelow's Rose Salve. labello...don't know if it has made it's way across the pond yet...i will have to bring you some, it is to die for! blistex herbal answer or smooth & shine! oh, geez. Bebe from Deutschland! My sister is a German PhD student and has spent a lot of time there since 1999. She always brings me back 4 or 5 or 10 (which lasts me at least until the next time she goes back). I haven't bought chapstick in years! I can't betray my beloved Bebe! The new Burt's Bees with color (I've tried the 2 red ones) are nice! I wouldn't try to heal chapped lips with them or anything (for that, I use Aquaphor), but for during the day? Who doesn't want silky-smooth lips with just a hint of color? You won't see this chick outside the house without my signature 'midnight red' lipstick. :0) It's a discontinued drug store color, but thank God for ebay--i can still get it there! It's embarrassing how much I have stockpiled. Have fun a the banquet! Ace will be serving you guys! And enjoy this weekend. So proud of you and TIM! You guys are so inspiring! Burt's Bees Tinted Lip Balm is like the Great Compromise. It's chapstick but the with the color of lipstick. It makes any face rosy and lips like berries! It is so soft and so practical all at the same time. My favorite color is fig. With the tinted lip balm, you get feminine+practical. So can you tell that I like It? Yes To Carrots-I find it at Walgreens or Target and try a different type every time! Mint, melon, berry. They also have tinted varieties that go on smoothly and moisturize...great for dressing up. I like it better than Burt's, but it is the same price. I'm kind of cheap when it comes to lip balm, so I still rock the flavored Bonne Bell LipSmackers. My guy seems to be amused by this, especially the grape flavored one. mentha colored lip shine from bath and body works! it's the bomb.com! Tinted lip balm. Such as "Burt's Bees" or "Yes to Carrots" (organic). Lip gloss can be a fuss, but it is nice to have the bit of sheen from the tinted lip balm. Plus since it is so sheer you cant really go wrong with a color. Takes the guess work out! I love burt's bees watermelon lip shimmer! Clinique's Long Last Glosswear in 'Air Kiss' -just a tiny hint of color with the shine. Perfect all year round and bonus points for being SPF 15. PS- some bright and funky nail polish on the toes might divert eyes away from the boo-boo! Can't beat the Burt's! P.S. I love the dress and heels - very pretty. The scab adds character! Hands down Sugar Rose by fresh. A little pricey, but totally worth it! I'm so boring... good old, plain as you can get ChapStick. Nothing makes the old lippies feel better. Ahhhh, I swear by Palmer's Cocoa Butter Formula. They make a normal-sized version, but I love the large, glue-stick-esque one! There's SPF and it smells/tastes a little bit like chocolate. So great. Neutrogena lip balm. The plain stuff in the white tube. We call it Magic in this household. Because it is. I love the lipgloss at Victoria's Secret! It comes in so many pretty shades and lasts longer than anything else I've used. burts bees makes a fabulous tinted balm/gloss...in a brown tube at your local target...check it out. Nivea - it's in a blue tube and looks like a glue stick.